Congratulations on refusing to be a sheep and meekly agreeing to hand over a third of your home equity to a broker just to sell your home! So what are the next steps to sell your home For Sale By Owner in New York City? We’ll explain in this article the immediate next steps you’ll need to follow to successfully sell your home without a traditional real estate broker. Presenting your property listing in the best possible light and leaving buyers with a positive first impression is one of the most important steps you must follow when selling your home for sale by owner in NYC. You will be competing with traditional agent listings featuring professional real estate photography, so don’t expect buyers to pay top dollar or remember your listing over a professionally marketed listing if you snap photos of your home with a cell phone camera. 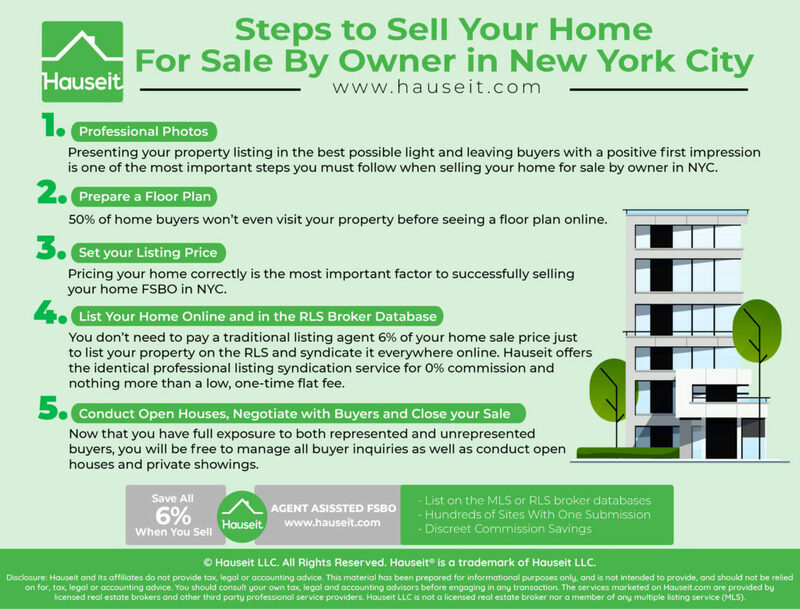 Hauseit offers NYC FSBO home sellers top-notch professional real estate photography for very affordable rates and fast turnarounds. 50% of home buyers won’t even visit your property before seeing a floor plan online. If you don’t already have one, we can have a custom floor plan professionally measured and drawn for you in 72 hours. Pro Tip: As a FSBO home seller in NYC, you will be competing for buyers against properties which are professionally marketed by experienced listing agents. Want your home listing to stand a league above the competition? Consider a stand-alone, fully customized property website for buyers to see the full picture about your home. Pricing your home correctly is the most important factor to successfully selling your home FSBO in NYC. Price your home too high and you run the risk of your home sitting on the market for too long and losing confidence as buyers ignore your listing. 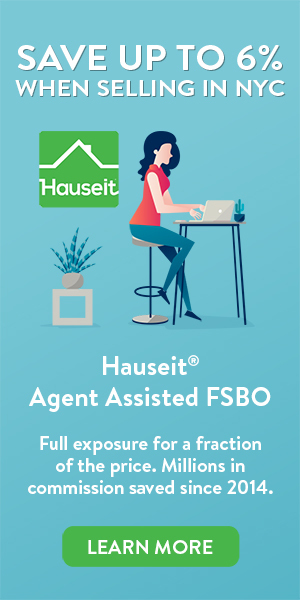 Agent Managed Listing customers are eligible for a free Comparative Market Analysis of their home done by a Hauseit affiliate agent. Want a professional real estate appraisal that banks would use? Get an independent valuation of your home done by a licensed and certified real estate appraiser so you can substantiate your listing price to buyers. You don’t need to pay a traditional listing agent 6% of your home sale price just to list your property on the RLS and syndicate it everywhere online. We offer the identical professional listing syndication service for 0% commission and nothing more than a low, one-time flat fee. That means your listing appears on the RLS (REBNY Listing Service) broker property database, StreetEasy, OLR (On-Line Residential – NYC Broker Database), Nestio (NYC Broker Database), RealtyMX (NYC Broker Database), RealPlus (NYC Broker Database), Brownstoner, Agorafy, Placebee, Padlister, NYBits, Naked Apartments, Hotpads, Apartments.com, CitySpade, Zillow and Trulia – all at once! Don’t have the time required to sell by owner in NYC? Consider our cost-effective, professionally managed, full service listing option for only 1% seller broker commission! Benefit from all of the benefits of a traditional, full-service listing without the steep 6% listing agent commission. Now that you have full exposure to all home buyers and protection from broker solicitation, you will be free to manage all buyer inquiries. Receive all buyer and broker inquiries plus benefit from initial screening of buyers’ agents to maximize your chances of success. Need assistance with open houses? We offer up to two complementary, managed open houses so you can save time and minimize agent solicitation. Need more than two open houses? We offer the ability to rent an open house agent for a low, flat fee. What’s next after you’ve received an offer? Manage the NYC closing process with the help of an experienced real estate lawyer who will negotiate the purchase contract and conduct the closing on your behalf. Lawyers are absolutely necessary in NYC and New York State in real estate transactions. Not only will they be instrumental in conducting legal and financial due diligence on your behalf, but they’ll also review and negotiate the purchase and sale contract on your behalf!